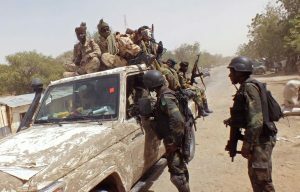 About 23 Nigerian soldiers comprising of five officers and eighteen soldiersare yet to be accounted for after Boko Haram insurgents ambushed a military convoy at Boboshe village in Bama Local Government Area of Borno State. Eight trucks were also missing after the attack which occurred early on Saturday. A competent military source told NAN that the insurgents in their hundreds ambushed the troops. Since then, many of the soldiers have been missing. He disclosed that only three of the 11 trucks deployed to the area returned to their base in Maiduguri, after suffering huge loss in the battle with the insurgents. “The gallant soldiers were ambushed by the insurgents, only three of the 11 trucks returned to the base. “It is not clear what happened but it was assumed the soldiers were missing following the ambush,” he added. When contacted, Danbatta Bello, the spokesman of the Civilian-JTF, an armed vigilante group that works with the military in Borno, told PREMIUM TIMES he was aware that there was an attack on troops near Bama, but he has no official confirmation on it. “Yes, we did hear about an attack on troops near Bama and that some of our Civilian-JTF members were involved; but I am yet to speak with our commander in Bama for official confirmation,” he said. A military source in Borno also told PREMIUM TIMES that a large reinforcement of troops has been deployed from Maiduguri to Bama following the incident. Efforts to get relevant military officials in Maiduguri to make comments on the attack were not successful as calls and text messages sent across to them were not returned or answered. However, the spokesman of the Nigeria Army, Texas Chukwu, told PREMIUM TIMES on phone from Abuja that he could not immediately confirm the incident. “I will be in Maiduguri tomorrow and when I get there, I might attend to your question when I get adequate information on the said incident. “For now, I cannot confirm anything; but be rest assured you will hear from me by afternoon of tomorrow, Monday,” said Mr Chukwu, a brigadier general and director of army public relations. The Friday attack came at the time the Borno State Government and the military are sanctioning the return of more displaced persons to their respective “liberated” communities which the military said have been safely cleared of all kinds of possible attacks. The presidential initiative on North-east Nigeria (PCNI) was also in Maiduguri last week where it had series of roundtable discussions with stakeholders on the safe return of IDPs to their homes. A committee was inaugurated on Friday to supervise and ensure that IDPs are returned to their homes in safety and with dignity. Meanwhile, residents of Jilli community in Gubio Local Government Area of Borno State, on Saturday fled the town following an attack by Boko Haram insurgents. It was learnt that the insurgents attacked the area from the Lake Chad area, forcing the residents to flee. Bukar Mustapha, one of the residents, told NAN that he and other villagers fled their homes when they received report that the insurgents were coming to attack them. “In the afternoon on Saturday, we heard that the insurgents gathered in the nearby bush preparing for the attack. “On Sunday morning, I called Gubio and I was told that the insurgents had attacked the town during the night time. I do not have the casualties because the situation is still not clear at Jilli,” Mustapha said. Another resident who pleaded anonymity said troops had been deployed to the area.